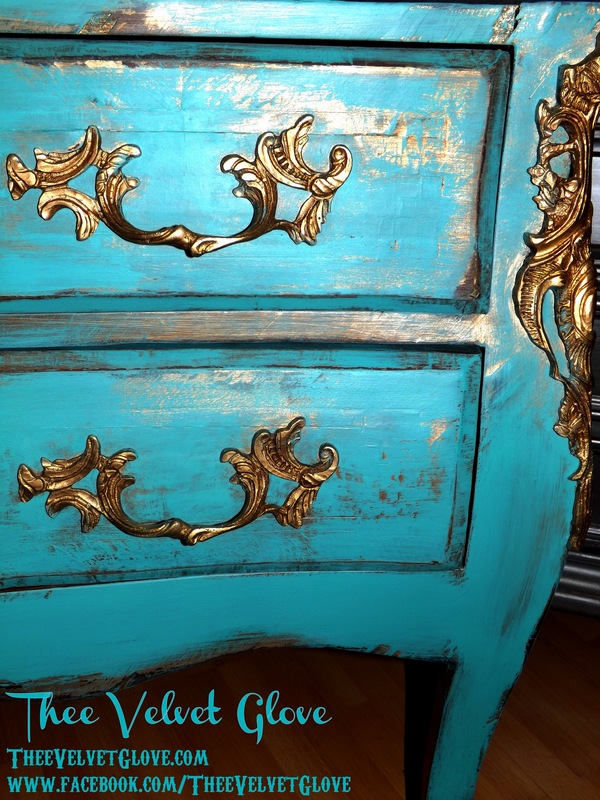 Add an element of grandeur to your home with this vintage solid wood Frenchy Commode fashioned with an aura of elegance. 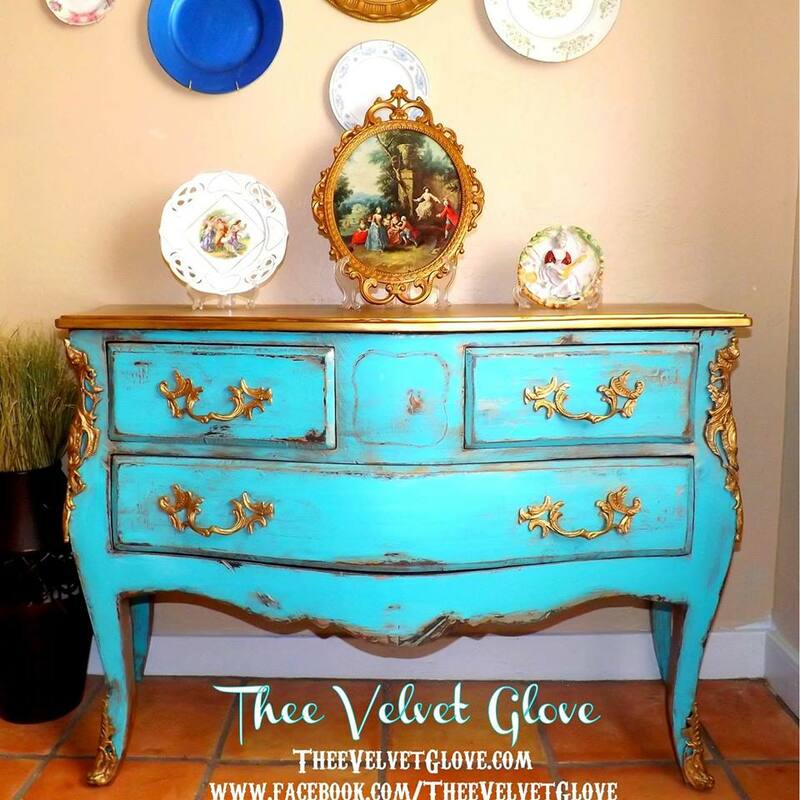 Hand painted in vibrant layers of golds and blues to create a simply eye-catching piece, embellished with opulent gold ormolus, distressed then glazed in a deep whiskey hue. Three dovetailed drawers. Scalloped front. Authentic craftsmanship accompanied by fabulous character. Very out-of-the-ordinary. 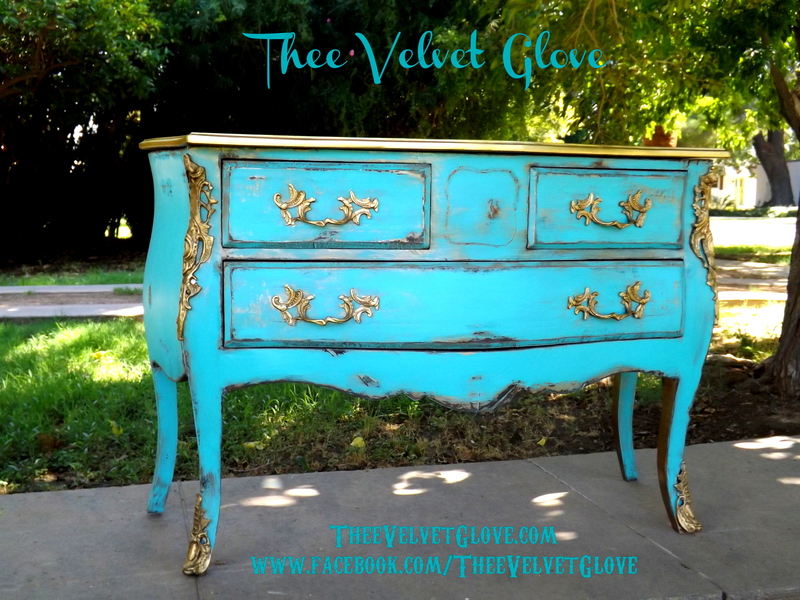 Would be stunning in an entry way, hallway, boudoir or as a dressing table in a powder room. She’s also ready to go onstage as a prop in a bridal photo shoot. 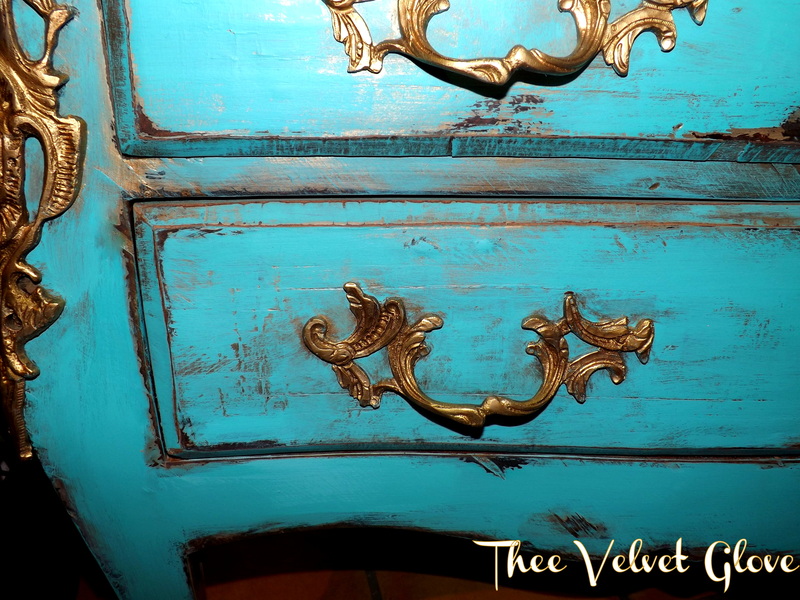 An heirloom piece for those who fancy details, mystic and the furniture of yesteryear. 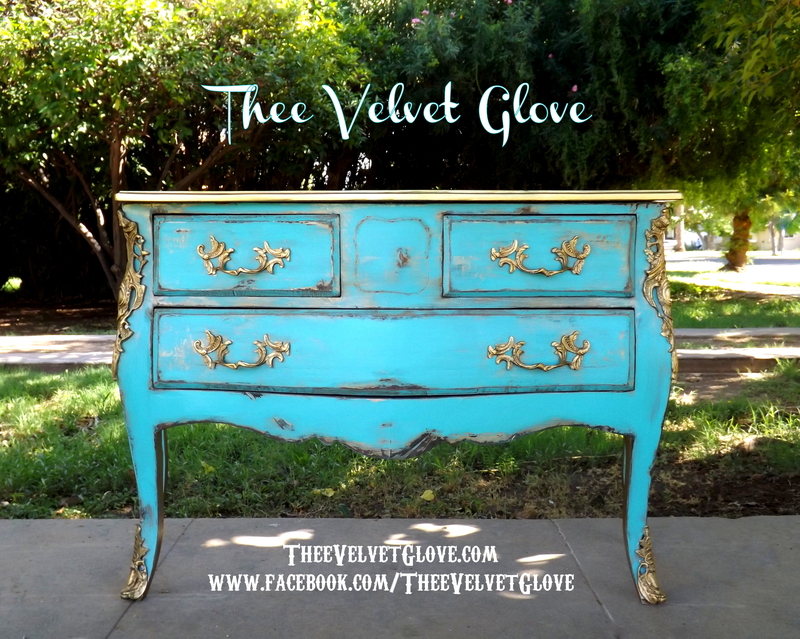 This entry was posted in Buffet/Sideboard, Dresser/Chest, FOR SALE, Uncategorized and tagged aqua, distressed, elegant, french, frenchy, furniture, glazed, gold, metallic, turquoise, vanity, vintage by theevelvetglove. Bookmark the permalink. 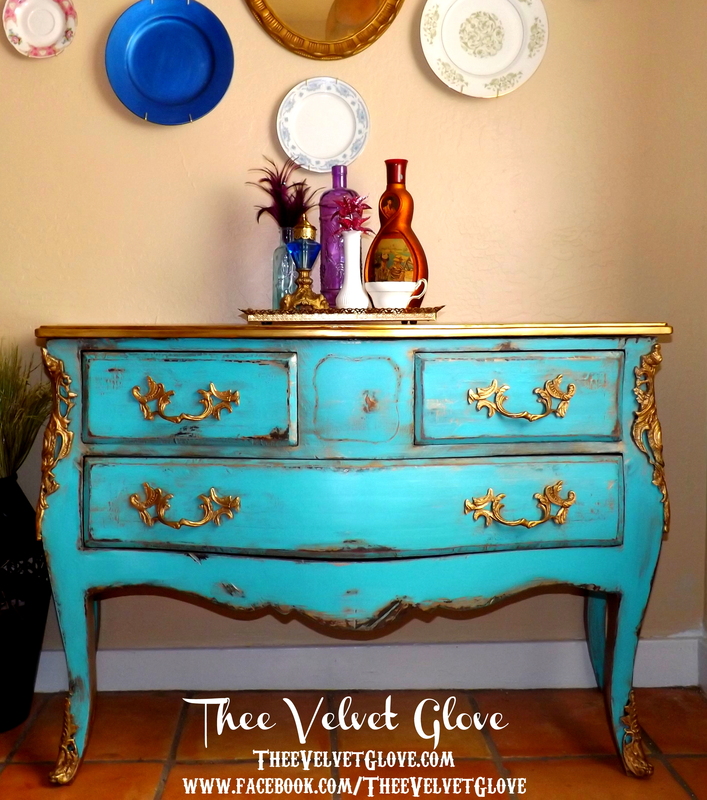 GORGEOUS…What paint color is this…it’s such a beautiful blue! 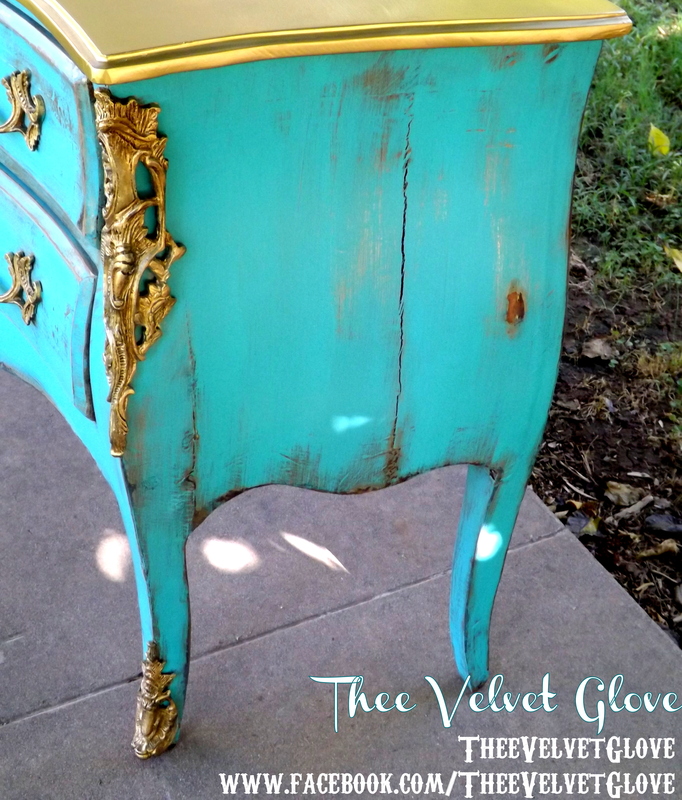 Your work is one of the most beautiful, meticulously executed repurposing I have ever seen. Absolutely gorgeous!. Wow. Thank you so much Kathy. That’s quite a compliment. XOXOXO. This is stunning!! All the gold details, love the top. Sigh! WOW!!!! this is simply breath-takingly beautiful!!! I can’t stop staring… Is that rude? lol! just anted to compliment your incredible work….